Set aside the first 90 minutes of your visit for an entertaining narrated tour of the island on the Old Town Trolley or the Conch Tour Train. They give you a great vantage point from which to see sights you might otherwise miss. You’ll get an insider’s view of the free-spirited community, experience the buzz of activity along the narrow streets, and catch whiffs of fragrant frangipani and fresh Cuban coffee. You’ll go from the Gulf of Mexico to the Atlantic, passing by all the important places along the route: Hemingway’s home, the Southernmost Point, the Historic Seaport, to name a few. You’ll marvel at the magnificent kapok and the flame-red Royal Poinciana, and catch details on the charming homes pointed out along the way. You’ll be introduced to the quirky: dogs in sunglasses riding scooters; sun-baked palm weavers barely visible on frond-laden bikes; red-combed roosters holding court; and wildly painted conch cruisers driving by. Tours operate daily. Enjoy the clear waters around Key West any way you choose: on fishing boats of all sizes, catamarans, sailing vessels or kayaks. All are available for hire through hotel concierges, in booths around the island, and along the waterfront where they are docked. Operate daily. Climb the tower of the Shipwreck Historeum, for a 360° unparalleled view of the island. Or, elevator up to the 7th floor of the historic La Concha hotel, midway up Duval Street for a similarly spectacular view of the town and a drink from the Top of the La Concha bar. Both are open daily. The Florida Reef Tract, off the Florida Keys, is the most extensive living coral reef system in North American waters and the third largest system in the world. Spectacularly beautiful, it can be experienced on one of the many dive or snorkeling excursions available. For those not wishing to get into the water, glass-bottom boats offer the opportunity to view this extraordinary aquatic habitat. Boats go out daily. 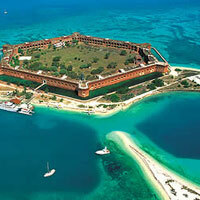 A day trip aboard the Yankee Freedom to the Dry Tortugas is an unforgettable experience. The small island 70 miles west of Key West is the site of a massive red brick Civil War era fort surrounded by coral reefs for snorkeling. The Yankee Freedom operates daily, weather permitting. Each evening in Mallory Square, crowds gather in a street fair atmosphere complete with entertainers to celebrate the sun as it dips into the Gulf of Mexico, hoping to glimpse the illusive green flash. Free.On the way to or from Sunset Celebration try a mojito, Bacardi rum laced with sugar syrup and mint, and enjoy the sounds of salsa at the outside bar at El Meson de Pepe, a Cuban Conch restaurant located in Mallory Square. Open daily. Every evening, tall masted sailing ships, contemporary catamarans and other vessels docked at the Historic Seaport and the Hilton Marina sail into the famous Key West sunset. The lure of the island lifestyle and surrounding sea led Ernest Hemingway to live in Key West on and off between 1928 and 1940. He penned some of his best works, including A Farewell to Arms and The Snows of Kilimanjaro, in this home on Whitehead Street. Get a feel for the Hemingway legend during daily tours. Have an up-close encounter with sharks, barracuda, grouper, eels, turtles and every imaginable sea creature in the Florida Keys aquatic habitat. This Key West treasure offers a great way to see the colorful sea life without having to get in the water. Open daily with special guided tours four times a day. Great food served in an unusual atmosphere. The outdoor bar is at the foot of an old water tower, chickens scratch about, cats lounge around, and a rope swing hangs from a huge tree. Breakfast, lunch (brunch on Sundays) and dinner are served at tables set on packed earth out in the side yard of a home in the Bahama Village residential neighborhood. Cheeseburgers in paradise served with Jimmy Buffet music, a touchstone for all Parrotheads who visit Key West.